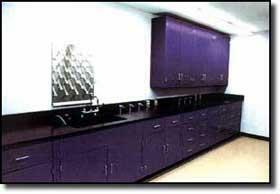 A wide range of cleanroom casework cabinets and clean room furniture are offered by CleanroomSupply. They are available in solid white, polypropylene plastic, painted steel, or wood covered plastic laminate. 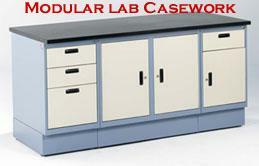 Cleanroom base cabinets or wall cabinets are available to create labs or work areas. Several clean room counter top materials can be provided. Free standing cleanroom storage cabinets for use as clean room furniture or in a laboratory are also manufactured. These cleanroom storage cabinets can provide class 100 cleanroom HEPA filtered air if the application warrants. They can be used as filtered cleanroom garment storage cabinets, cleanroom supplies storage cabinet, or general purpose handling of cleanroom items. The cleanroom storage cabinets for furnishing your cleanroom are fabricated of either stainless steel or painted steel. The adjustable shelves can be either solid or open style for cleanroom air flow. Standard doors for these cleanroom cabinets are clear acrylic. Our HEPA Filtered Storage Cabinet is designed to meet a variety of cleanroom needs. 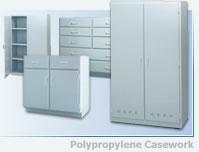 Our line of storage cabinets is designed to meet a variety of cleanroom needs.